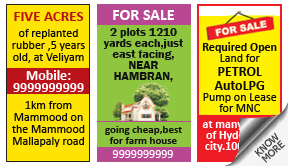 Why place Property Ad in Mathrubhumi Newspaper ? Property ads are usually employed by those looking to lease property for rent. Most occasionally, the lessee has to mention what he is willing to rent out his property for, viz for office or residence. The ads also usually mentions certain facts about the property, along with the address and contact number. The simple booking process takes less than 10 minutes and is 100% online. Not only do you not incur any additional charges for booking online, releaseMyAd gives advertisers amazing deals and offers that help you save money. You can check the progress of your ad during the various stages of processing until the final approval is granted and your ad is ready to be printed. Numerous payment options, some of which are online. • Sanctioned plan ground plus three floors having an area 4200 sq.ft on 2.75 k land near D-Block,Tollygunge, for sale. Contact 9876543210 Box PR 4567, Samay, Kolkata-42. • For Sale in Daman, a 3 bhk fully furnished flat, area 1621 sq. ft., Can be used as a holiday home, 3 hrs. drive from Mumbai. Contact: 9876543210 . 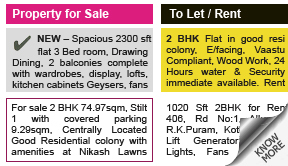 How To Book Property Ad in Mathrubhumi Newspaper ? Compose your ad. You can take a look at our sample ads gallery to get an idea of how to compose ads properly. Finally, select advertising date and clear payment via a host of online & offline methods. If you wish to book your ads now, you can start your campaign by choosing your ad category from the section at the top of the page. Alternatively, you can learn more about Property Ads & Mathrubhumi by clicking on the appropriate tab above. Now Get The Property Advertising Rates on Mathrubhumi!